We invite you to explore the extraordinary desert landscape of Joshua Tree National Park in spring time. This workshop provides a great opportunity to develop your personal style, enhance your creativity, refine your photographic vision and improve your technical proficiency as we discover extensive stands of strangely twisted Joshua Trees and surreal geologic formations . Two unique deserts come together at Joshua Tree. The Colorado Desert in the eastern part of the park is below 3,000 feet and in this arid land spidery Ocotillo plants, jumping Cholla cactus and the abundant Creosote Bush can be found. 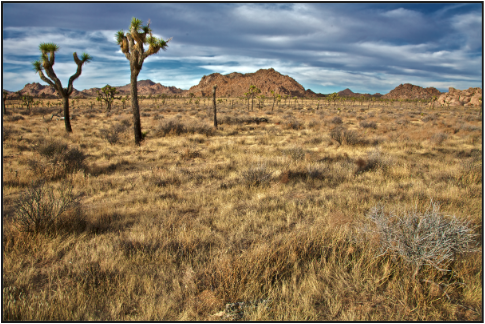 The higher and wetter Mojave Desert to the west is home to the special habitat of Joshua trees. Both deserts give us ample opportunities to photograph very different environments. Our travels find us at Skull Rock, morning reflections at Barker Dam, Arch Rock, Split Rock, Queen Valley Road’s tallest and oldest stands of Joshua Trees, a backroad trip through Geology Tour Road, and visits to Cholla Cactus garden and Ocotillo Patch. We have a special evening of Astrophotography planned, timed with the new moon, to give us the chance to create star trails from many long exposures. Day 1 - Sunday: Meet in Twentynine Palms at 4 p.m. for our first two hour lecture and orientation followed by dinner. Day 2 - Monday: We begin our sunrise shoot at 6:15 a.m. to Skull Rock which is an easy 1.7 mile loop trail hike filed with amazing rock scenery and desert plants. We will return to Twentynine Palms for breakfast and a break then meet for our second lecture from 11:00-1:00 p.m. In the afternoon we will visit the Oasis Visitor Center and walk through the Oasis of Mara fan palm oasis. We will have a early dinner and then visit Keys View for panoramic views from the Salton Sea to San Gorgonia Mountain. We will then set up our cameras, tripods and other equipment for an evening of Astrophotography at Hidden Valley, finishing up well after midnight. Day 3 - Tuesday: We will sleep in, have breakfast then meet for our third lecture from 11:00-1:00 p.m. Our afternoon adventures will take us to Arch Rock and a 2.1 loop trail hike to Split Rock. Day 4 - Wednesday: We leave at 5:45 a.m. for our sunrise shoot at Barker Dam which is a 1.1 mile loop trail hike. We will return to Twentynine Palms for breakfast and break, then meet for our print review from 11:30-1:30 p.m. In the afternoon we will explore the northern end of Wonderland of Rocks, Rattlesnake Canyon and then Indian Cove Trail which is a short 0.6 mile loop hike. Day 5 - Thursday: We leave at 6:00 a.m. for our sunrise shoot at Queen Valley Road which has some of the tallest and oldest Joshua Trees in the park. We will return to Twentynine Palms for breakfast and break, then meet to process images from 11:00-1:00 p.m. In the afternoon we will take a drive along Geology Tour Road and finish the day at Cholla Cactus Gardens and Ocotillo Patch for our sunset shoot. Day 6 - Friday: At 6:00 a.m. we visit Cap Rock Nature Trail to a .4 paved loop trail to a massive granite dome has an overhanging balanced rock near it’s top. Gram Parson (country rock star) died in 1973 and his request was to have his body burned here. We return to Twentynine Palms for breakfast and the workshop will conclude. Our workshops emphasize field work, however we feature a balance of field work, classroom-based sessions, critical review of your work as well as ample time to answer your questions. This workshop features 6 hours of classroom instruction and 2 hours reviewing workshop participant's images. Day 2: 11:00-1:00 p.m. Art - taking your photography to art. The session begins with the interaction of aesthetics, art and technology: how to use and break the rules effectively. CTF2 - composition, color, tone, texture, form and frame: a model for thinking about your work. Day 3: 11:00-1:00 p.m. Craft - workflow and presentation of your work. The session begins with a tour of "workflow" and we present a simple approach to processing your images. It is followed by a review of using color management effectively and a discussion about preparing your images for presentation on displays, the web and the "fine art" print. Day 4: 11:30-1:30 p.m. Review - what makes a great photograph? During this session we review and comment on your work. Please bring 3 prints of your 'best' work for evaluation, critical review and sharing with the group. Day 5: 11:00-1:00 p.m. Processing Workshop. The weather in Joshua Tree averages 85 degrees in the daytime and lows can fall to 35 degrees at night. Make sure to dress warm for our evening star trails shoot. The key is to be prepared for a wide range of weather conditions and temperatures, bring layers and an outer layer suitable for evenings. Hiking boots are the best choice for footwear. Bring plenty of water and snacks during our location shooting. Consult our gear checklist to learn what we recommend that you bring. Workshop participants are responsible for their own lodging, meals and transportation. The town of Twentynine Palms features many lodging choices that can be found at the Lodging website. We will often eat meals together, however you are free to join us or eat independently.